Forrest Griffin will have a date for New Year’s Eve weekend after all. 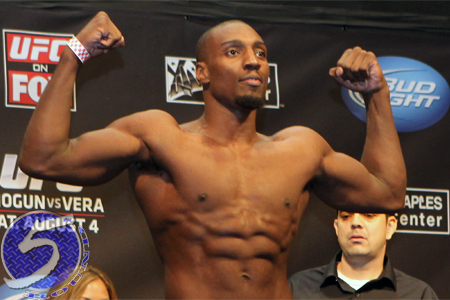 On Friday morning, it was announced the former light heavyweight champion will now face Phil Davis (Pictured) at UFC 155. Griffin was initially slotted to battle Chael Sonnen in the December 29th event, but Uncle Chael unexpectedly emerged as the division’s top contender earlier this week and now has bigger fish to fry. Davis is less than a week removed from submitting Wagner Prado at UFC 153. “Mr. Wonderful” owns an impressive 10-1 (1 NC) professional record. Griffin was last seen beating Tito Ortiz at UFC 147. It was revealed shortly after the unanimous decision victory that the 33-year-old Griffin was medically prescribed Testosterone Replacement Therapy for the scrap. MGM Grand Garden Arena in Las Vegas, Nevada hosts UFC 155. A heavyweight title tilt between champ Junior dos Santos and Cain Velasquez is expected to headline the festivities.